Get smitten with a kitchen in a cool color scheme, whether it’s romantic floral blues that soothe, saturated sapphire that energizes, or lively turquoise that inspires. Invite this hue into your design and capture the tranquility of the ocean or the energy of a blue flame. A large kitchen needs some visual weight to keep it grounded. 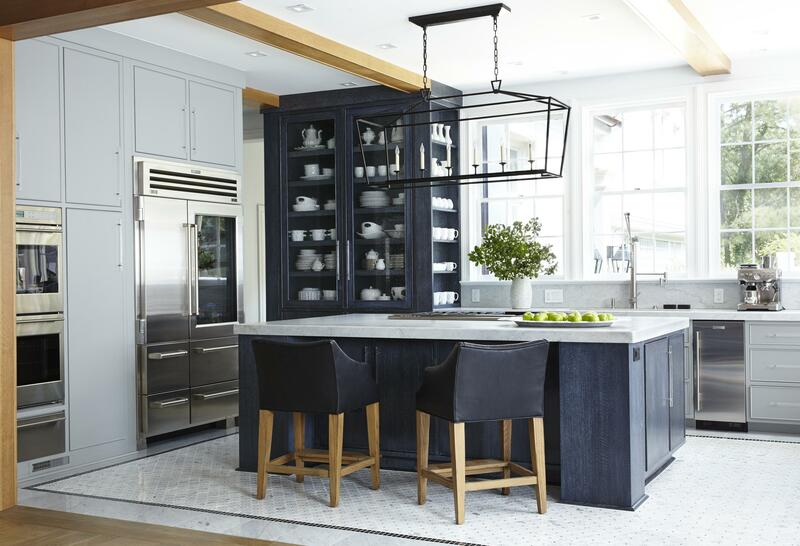 In this space by interior designer Terra Palmer, dark marine blue on the island and a floor-to-ceiling hutch introduce a handsome blue tone that almost reads black. Limiting the dark shade prevents it from overwhelming the space. Stainless-steel appliances and a large commercial-style faucet reflect light around the bright kitchen while an open lantern-style chandelier mixes in a darker metal finish. Wooden beams and the island chairs bring in natural texture. Cloudy gray perimeter cabinetry and timeless marble countertops balance the depth of the navy island. Oversize windows behind the sink contribute generous amounts of natural light to keep the look bright. White cabinets recede into the back wall of this kitchen, allowing the deep-blue island to stand out. “You can treat an island differently from other parts of the kitchen as long as it somehow relates to the other areas,” architect and interior designer Ili Hidalgo-Nilsson says. All of the cabinetry has a glossy lacquer finish, which adds a European sophistication to the room. A glass-front refrigerator and globe-shape pendant lights are both a little modern and a little traditional, just like the cabinets. 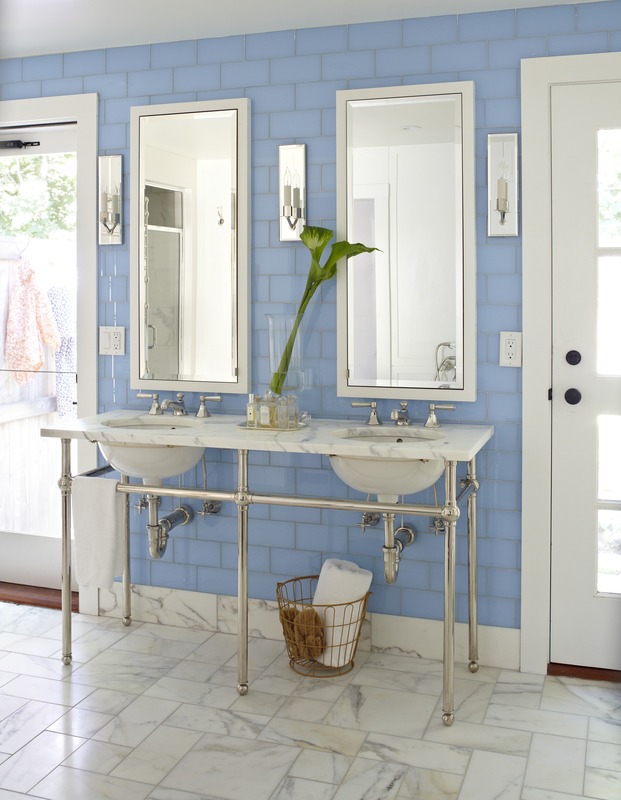 A fresh blue-and-white palette is carried throughout this bath by interior designer Maureen Footer. Urban Archaeology tiles accent the walls. Footer designed the vanity, which was executed by Waterworks. 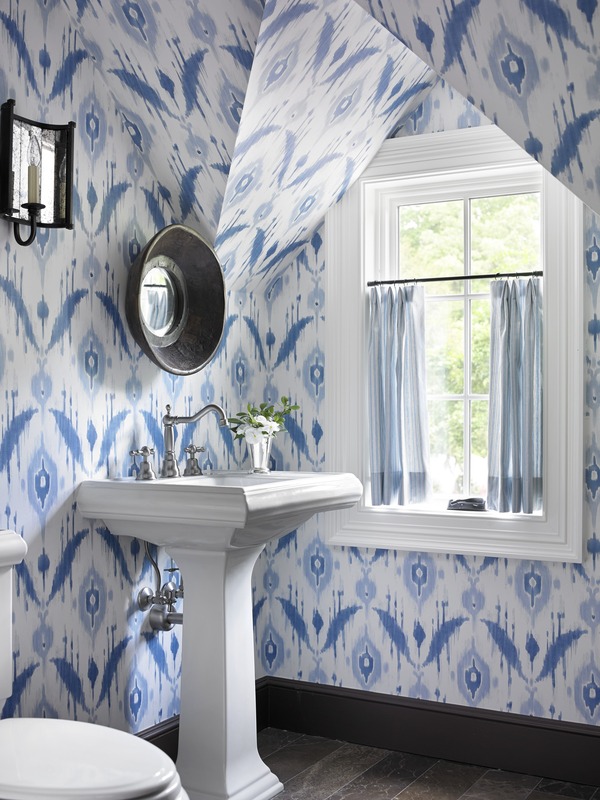 The walls of this guest bath are covered in an exuberant ikat paper from Thibaut. “Using something so patterned camouflaged the angles and eaves more than if we’d painted,” interior designer Heather Dewberry says. 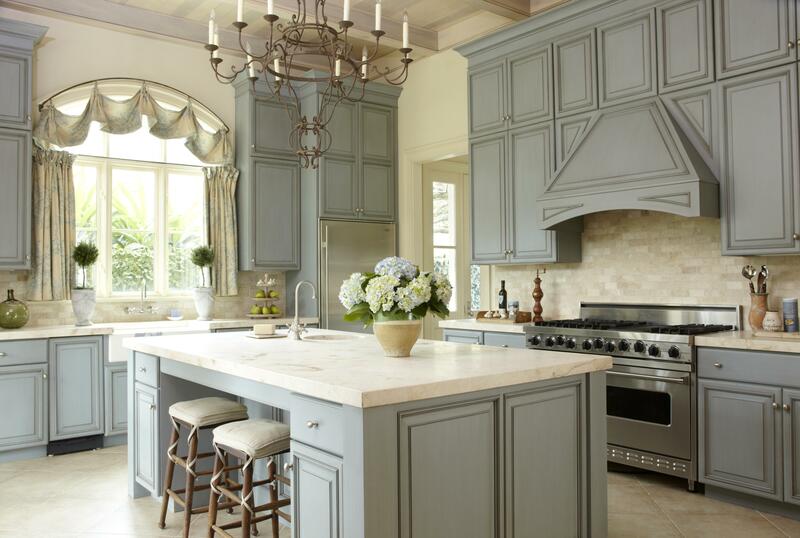 Culinary-caliber appliances, chic transitional style, and a burst of bold color freshen this country French kitchen by designer Jodi Geran. The brilliant blue ranges and hood take center stage in this kitchen, thanks in equal part to their commanding presence and the neutral backdrop of white and stainless steel. The backsplash in this kitchen by interior designer Desiree Ashworth is infused with watery blue subway tile. Running the tile to the ceiling on the range wall makes a color statement without distracting from the rich mix of textures used throughout the room. 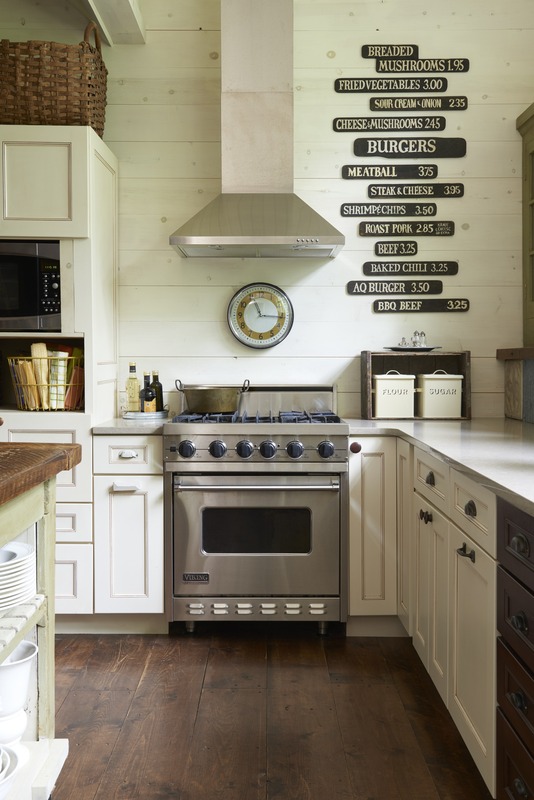 A gleaming commercial-style range hood and built-in refrigerator boost the contemporary feel while industrial pendants over the island and vintage-style stools give the hardworking space a timeworn appearance. Juxtaposed with the high-gloss tile are more weathered finishes on the cabinetry and floor. This combination gives the room rustic character without being too country and a touch of glamour without feeling too modern. Mix a small dose of soft blue with wood and lots of natural light for a warm, cozy feel. While the island in this kitchen by architect Kate Johns is dressed in natural stain, perimeter cabinets don a historical gray-blue color that shows green undertones in certain light. White crackle-finish subway tiles form the backsplash. 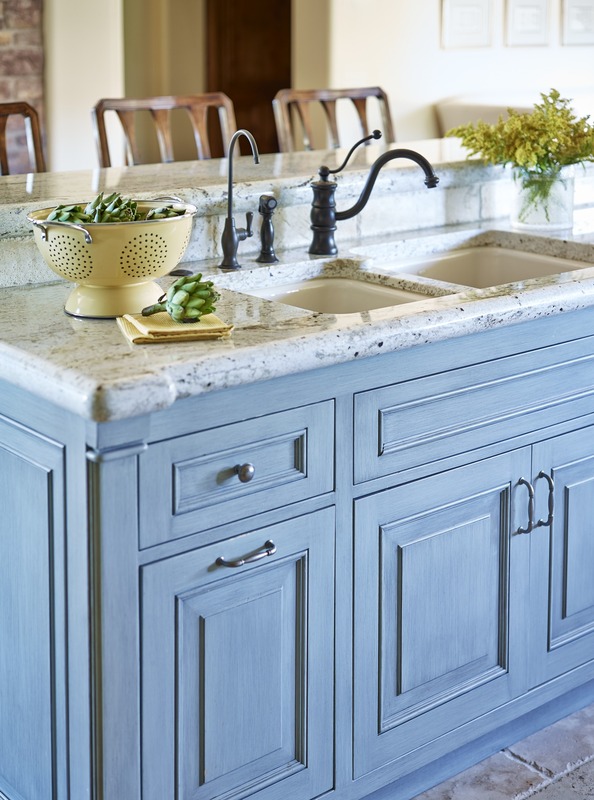 Pair sky blue with marble and white cabinetry for a cool, elegant look. 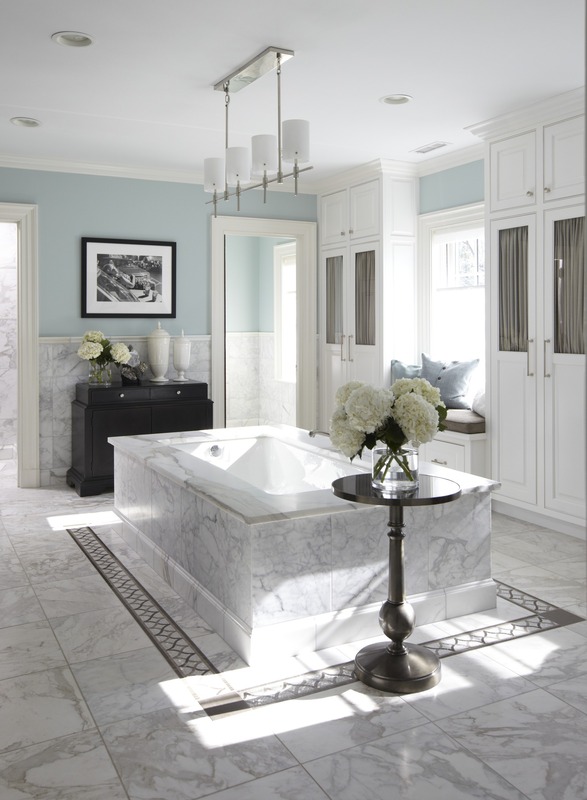 Abundant white cabinets and a stunning marble tub surround are set off by walls painted Benjamin Moore “Palladian Blue” in furniture designer Bob Williams’ master bath. A vanity and black wood cabinet provide additional storage space. Go big with a soft shade. 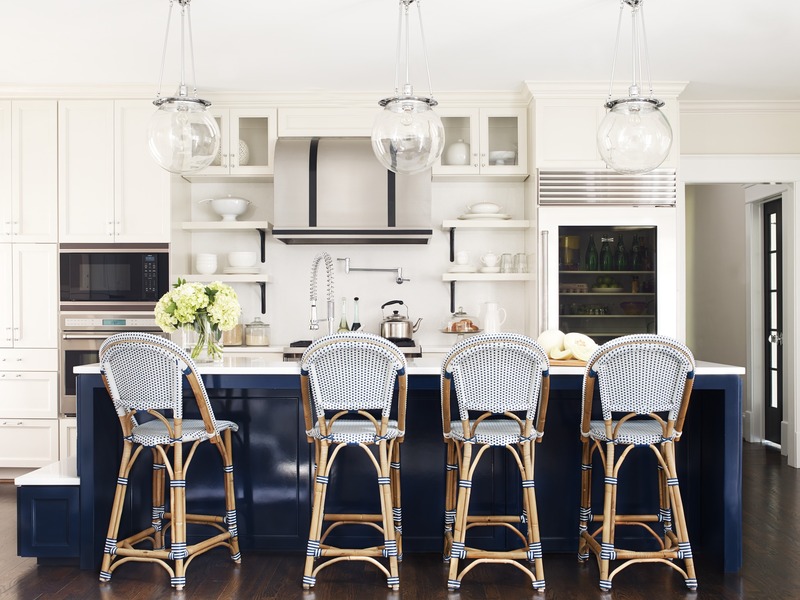 All of the maple cabinetry in this kitchen by architect George Hopkins and interior designer Alix Rico is painted country French blue. A glazed finish over the paint prevents the color from overpowering the room. Detailed molding on the cabinet doors also breaks up the monotony of a single tone. Neutralize the heavy use of blue in the cabinetry with off-white and beige tones. Here, a limestone countertop and a marble-tile backsplash quiet the color scheme. Abundant natural light also enhances the fresh feel of this blue kitchen. If you opt for colored cabinets, consider what type of lighting brings out the best look from morning till night. Accent with woods and metals that suit your overall design theme. Here, an intricate wrought- iron chandelier and exposed metal rods on the window treatments complement the room’s country French style. Wooden stools and serving accessories add touches of rustic charm to the formal look. 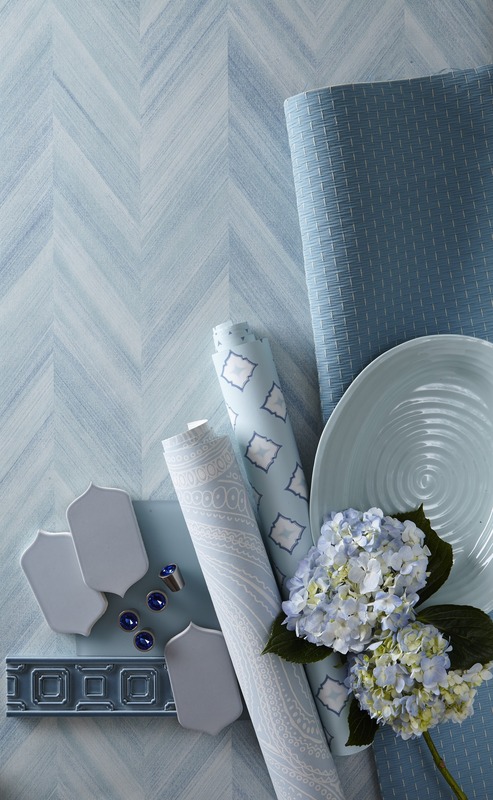 Create a soothing backdrop for soft blues with lots of neutral tones. Abundant use of white and gray on the vertical elements in this kitchen by kitchen designer Jason Landau gives the space a clean feel. Darker surfaces on the floor and countertops balance the light look. Metallic details suit the color scheme without introducing a competing hue. blue. Similarly, the mosaic tile and granite countertop have smoky-blue undertones that support the kitchen’s beachy blue accents. Punch up a serene scene with bright accent pieces. 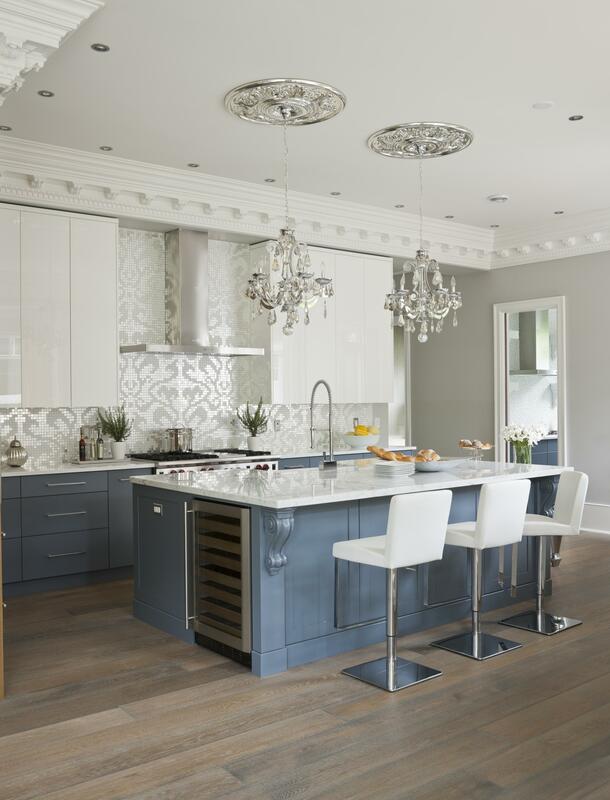 Here, cyan glass bottles and icy-blue pendants punctuate an otherwise neutral palette. Placing groups of the bottles up high visually connects them with the light fixtures and gives them more weight for a pleasing, eye-catching effect. When staging accessories, consider how they draw attention to, or distract from, the permanent elements in a room. See 15 small but luxurious kitchens & baths.